Beautiful and meaningful ~ our silver birthstone bar totem necklace includes a birthstone for each child or every member of your family. 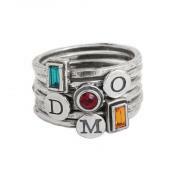 Customize with 2, 3, 4, 5, or 6 birthstones of those you love. 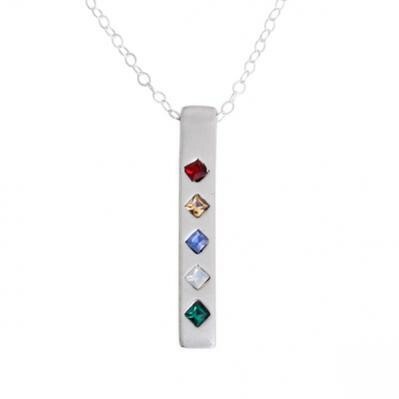 The birthstone bar necklace has gone vertical! Bar necklaces are so popular and can be seen in fashion magazines and on celebrities. 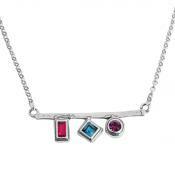 Nelle and Lizzy's birthstone bar necklace takes the concept a bit further by stacking the birthstones vertically. The birthstones represent each child or family member to add meaning to this simple and sophisticated design. The listed price is for 2 stones. If you want more stones the price will increase. The necklace is available in 16" and 18". All silver is sterling. The birthstones are Swarovski crystals. All sales are final. 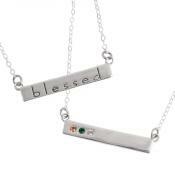 I purchased this necklace as a Christmas gift for my daughter. I had wanted to purchase this type of gift for awhile and was so pleased that I found one this beautiful within my budget! The chain is very nice & the perfect length. My daughter loved the necklace! The gems are pretty and the necklace looks classy and trendy at the same time. Would highly recommend this beautiful piece of jewelry!